For over 20 years, STEMCELL Technologies has helped to advance immunology research by providing fast and easy cell isolation products. 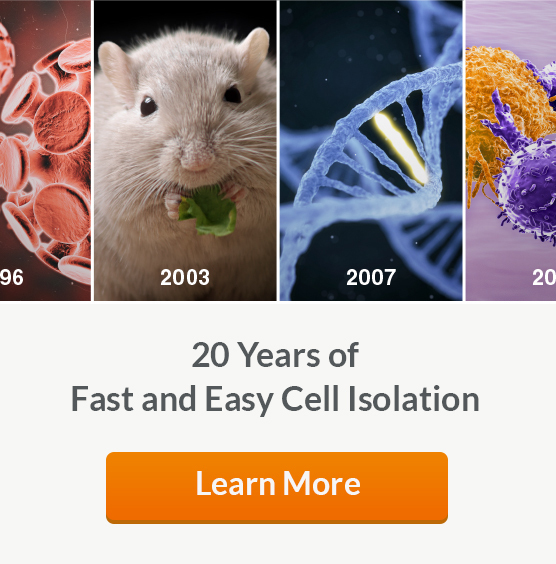 Here, we highlight and summarize some of the major scientific advances in different fields of immunology and how our cell isolation products support these research areas. Starting in 2010, research groups began to identify cells that have characteristics of lymphoid cells but lack lineage markers (Lin-) and re-arranged antigen specific cell surface receptors. As these cells were identified they were referred to by different names such as natural helper cells, nuocytes, innate lymphoid cells and innate helper 2 cells. In 2013 a uniform nomenclature was proposed to classify these cells as group 2 innate lymphoid cells (ILC2s). Scientists first began to experiment with chimeric antigen receptor (CAR) T cells in the late 1980’s, when researchers genetically engineered T cells to express an antibody that redirects their specificity. In 2011, a successful case of CAR T cell therapy for leukemia fueled a new excitement in immuno-oncology research. CAR T cell immunotherapy has since brought new hope to cancer patients who are seemingly out of treatment options. In 1996, major advances in human immunodeficiency virus (HIV) therapy were named “Breakthrough of the Year" by Science. By combining protease inhibitors with other drugs such as azathioprine, researchers were able to substantially reduce viral loads in infected individuals. Despite this discovery being a major step forward, HIV researchers still have much to do before the disease is truly eradicated. In 2003, the role of FOXP3 in regulatory T cells (Tregs) was described as a ‘master transcription factor’. Since then, the number of research studies focusing on the immunosuppressive nature of Tregs had significantly grown. FOXP3 remains the most reliable marker of Tregs to date, and the importance of Tregs in maintaining immune tolerance continues to be highlighted. Although the role of pro-inflammatory cytokines in obesity-associated metabolic dysfunction had previously been described, scientists first began to identify immune cells in the adipose tissue and investigate how these cells contribute to obesity-associated inflammation in 2003. In 2007, human genetic variation was named “Breakthrough of the Year” by Science. The ability to detect variations in the human genome has allowed scientists to identify genes and variations associated with a multitude of human diseases, including autoimmunity, leading to subsequent breakthroughs in how we predict, treat and prevent diseases. In 2013, the promising results of cancer immunotherapy trials led to this field of research being chosen as the ”Breakthrough of the Year” by Science. With recent advances in checkpoint blockades and adoptive T cell therapies, researchers are increasingly interested in harnessing immune mechanisms for cancer therapy. In 2015, groundbreaking studies describing new applications of the clustered regularly interspaced short palindromic repeat (CRISPR)/CRISPR-associated protein 9 (Cas9) led to this gene editing technology being named “Breakthrough of the Year” by Science.